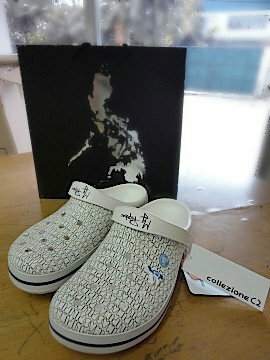 “Fashionalistic” local retail label Collezione C2 partners with international footwear brand Crocs to create an innovative limited-edition footwear design that’s casually chic and distinctly Filipino. The first-ever My Pilipinas Crocband debuted today as part the Crocs Fall/Holiday 2010 collection, with the design showcasing the Philippine map ⎯the signature of Collezione C2’s My Pilipinas apparel line. Designed by acclaimed fashion designer Rhett Eala, and made from Croc’s lightweight Croslite material to ensure comfort and odor control, this newest addition to the footwear brand’s range of products fuses form and function, and underlines the continuing emphasis on patriotism and community spirit. The limited-edition My Pilipinas Crocband’s launch served as the highlight of the recently concluded grand fashion show held today at the TriNoma Mall Activity Center in Quezon City, which featured key pieces from Collezione C2’s anticipated Holiday 2010 line, as well as the latest footwear models and 50 new designs of Crocs’ Fall and Holiday 2010 collection. Inspired by our strong, resilient spirit and adventurous nature, the My Pilipinas Crocband translates the country’s characteristic flair and aesthetic into footwear that Filipinos would be glad to own and proud to wear anywhere in the world. The limited-edition My Pilipinas Crocband will be available at selected Collezione C2 shops and Crocs Concept Stores starting October 30. No more maps please. I used to buy Collezionne C2 shirts eversince I saw it here it your blog. But when it came out with that yellow and black collection plus that yellow ribbon, I threw all my C2 shirts. They should come up with something else because the map has been too associated with the death of the yellow leader. i couldn't agree more! i never thought crocs could get any uglier but this takes the cake.